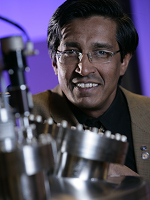 Dr. Jag Sankar (NCAT Distinguished University Professor and Director of NSF-ERC-RMB) over the past 29 years has developed a high-profile, internationally recognized, advanced materials/nanotechnology activities impacting surface engineering, environmental issues and biotechnology at NC A&T State University. He serves as Director of the Center for Advanced Materials and Smart Structures, Director for the Navy Center for Nanoscience and Nanomaterials, and Site coordinator for the NSF Nanoscale Science and Engineering Center. The ERC-RMB conducts transformational biomedical implant technologies for the economic impact and global leadership of the nation through national/international team of collaborators (scientists, clinicians), industries and economic development boards. Dr. Sankar received his Ph.D in Materials Engineering from Lehigh University and Masters from McGill-Concordia joint program.